If there ever was a competitor to the classic Ray-Ban Wayfarer, it easily belongs to the Ray-Ban Clubmaster. While the popular browline style was never meant to have a second life (let alone a third), the sunglasses with the bold upper frame have found another resurgence. 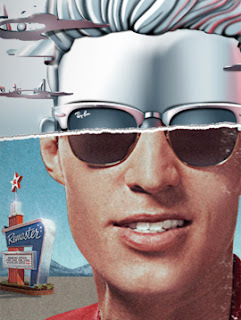 Ray-Ban has recently remastered the Clubmaster in all aluminum, making them lighter and cooler than their plastic predecessors. They also come in four frame options: black, gunmetal, silver, and bronze. All four are also trimmed in a complementing gold or silver. The Clubmaster has an interesting place in history. The Clubmaster itself wasn't around when browline glasses first became popular in the 1950s and 1960s. They weren't designed until the 1980s when the browline style stumbled into its second life after detective David Addison Jr. (Bruce Willis) wore a pair on the hit television series Moonlighting. Addison never wore them per se. He sported Shuron Ronsirs, which were the original browline sunglasses designed in 1947 by Jack Rohrbach. It wasn't until the series spurred demand in 1980s that Ray-Ban introduced its take on the browline design. The Clubmaster quickly became the third most popular brand of sunglasses in the United States. The newest resurgence for the Clubmaster is being fueled by an appeal for throwback fashions from the 1950s and 1960s. The trend began in the mid 2000s but continues to hold firm. Some people attribute it to various television series like Mad Men, but others have different ideas as to why the browline is back. Great design doesn't have a shelf life. The Clubmaster has been subjected to extreme stigmas across seven decades. Much like the 1460 Originals by Dr. Martens, the Clubmaster and greater browline style have been subjected to whatever stigma different eras invent for them. In the 1950s and 1960s, they became iconic among courageous and successful individuals, everyone from James Dean to Malcolm X, but they were cast as commonplace and conservative in the 1970s. The same thing happened again in the 1980s. After they returned to popularity, the browline fell out of style in the 1990s as they became associated with geeks, nerds, conservatives (again), and angry white men. The newest resurgence of browline glasses had grown out from the fringes. There are several modern influences at work too. The all-aluminum design is part of a bigger movement toward raw materials. Synthetics have taken a back seat to metal, wood and leather. Incidentally, the opposite was true when Rohrbach first came up with a design for Shuron. The original glasses featured a plastic browline fastened to a metal chassis. It made them lighter while making a move toward plastic (influenced by metal shortages during World War II). Nowadays, stronger aluminum is often lighter than plastic. The science behind the glasses made by Ray-Ban. The new aluminum Clubmaster by Ray-Ban isn't all about design. Some of it is about science. Almost all of the aluminum frames have been matched with polarized lenses, which Ray-Ban developed to reduce glare, enhance contrasts and improve clarity. The lenses absorb 85 percent of visible light and 99 percent of reflected light. Reflected light is the most common kind of light to cause eye strain. They do protect your eyes from harmful rays. The lenses were made to 100 percent of UVA, UVB, and harmful blue light up to 400 nanometers. Along with protection from the sun, the lenses are impact resistance. According to Ray-Ban, they resist as much as twice the impact of a common lens. The Ray-Ban Clubmaster Revives 8.1 On The Liquid Hip Richter Scale. The matte-finish aluminum frames are a striking next chapter in browline glasses and Clubmaster history. While I own several brands of sunglasses that I trade out depending on what I'm doing, the Clubmaster has become a favorite for more casual outings. You can order the new Ray-Ban Clubmaster Aluminum direct from Ray-Ban. The aluminum frames cost a little more, but the durability makes up for it. If you have a tighter budget, then look for the plastic models or hold off for a sale. As an another alternative, you can always look up the Shuron Ronsirs too. I like the Ray-Ban take a little better, but it's hard to argue with an original.